Level - Your current level. Stamina - Your current and maximum stamina you have. Gain Per Hour - How much stamina that you'll get every 1 hour. Next Gain - Countdown of your next stamina gain you'll get. Once timer reaches zero, you will gain stamina equal to the amount of Gain Per Hour. Recruit Link is used to get your friends and families to join this game under your character. When your recruit reaches certain level you will be awarded with FSP (Fallen Sword Point) (will cover this shortly) . Click on the icon to learn more about it. Current Level - The level you are at the moment. Progress - percentage of how close you are to level up. Current XP - Shows you your current XP you have gained. Next XP - Shows you the amount of XP needed to level up. Remaining - Shows you how much XP you need to gain. 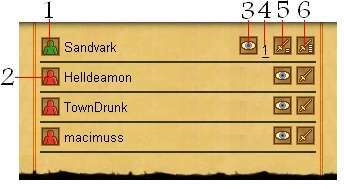 Gain Per Hour - How much XP you get every 1 hour. Next Gain - Countdown of your next XP gain you'll get. Once the timer reaches zero, you'll gain XP equal to the amount of Gain Per Hour. FSP is what you might call the diamond of this game. FSP can be used on variety of stuff like upgrading your account, upgrading your weapons and armors and etc..., and can fetch an incredibly high price. Gold - Shows how much Gold you are carrying in your hand. Bank - Shows how much Gold you have in your personal bank. Gain Per Hour - Shows how much Gold you get every 1 hour. Next Gain - Countdown of your next Gold gain you'll get. Once the timer reaches zero, you'll gain * Gold equal to the amount of Gain Per Hour. Next Deposit Reset - Show the exact Time, Date, Month and Year your next deposit you'll get. Attack > Defense = You'll successfully hit your target. Attack < Defense = You'll miss your target. Damage > Armor = Your damage can vary. Damage < Armors = Your damage will be reduced to 1. Travel North-West. Costs 2 stamina. Travel North. Costs 1 stamina. Travel Travel North-East. Costs 2 stamina. Travel West. Costs 1 stamina. Travel East. Costs 1 stamina. Travel South-West. Costs 2 stamina. Travel South. Costs 1 stamina. Travel South-East. Costs 2 stamina. When you see that color, it indicates that you cannot move to that square. When you see that color, it indicates that you can move to that square. * Note that the S key does nothing. Green indicates that its a creature. Red indicates that its a player. The eye will allow you to view your targets stat. Allows you a maximum of 20 action when combating a creature. Requires minimum 20 stamina to use this action. Allows you a maximum of 40 action when combating a creature. Requires minimum 40 stamina to use this action. Allows you a maximum of 60 action when combating a creature. Requires minimum 60 stamina to use this action. The Character Menu is where all your personal items, skills and messages can be found. what image you add, there are children playing in this game. Inventory shows what current gears your wearing. By highlighting on it, it will show their stats and how much durability they have. Backpack is where you can hold items. You start with 3 backpack at start, but you can increase your backpack space by upgrading it. 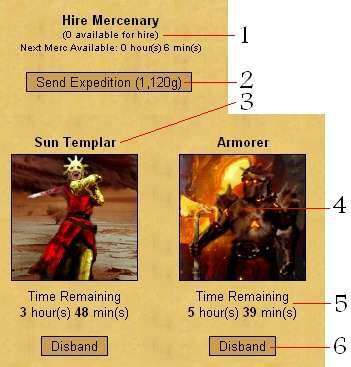 Enhancement are skills that can help you during fights in PvP , against creatures and lastly protection. Active Buff is where you see yours and other people buff to come up with some strategies before attacking someone. Medals is just a bonus to see achievement you made in this game. Recruiting is where you can see if people you recruited are playing or not. It also helps to keep track of them if your recruited a lot of people. Allies are allies, how much explanation you want me to say ? Offense Buff = Specialize in increasing your attack and damage. Defense Buff = Specialize in increasing your defense and armor. Special Buff = Specialize in increase your XP rate and Gold rate and other misc. stuffs. Every 1 level up, you gain 5 points. 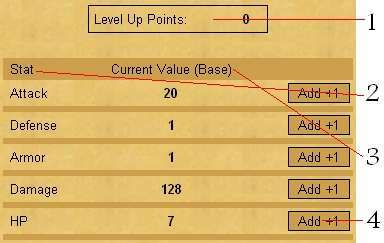 Level Up Points show the amount of points you can invest. Stat is stat, wont bother explaining that Razz . Current Value (Base) show how much points you invested in. Add +1 allows you to add 1 point to any of the stat you desire. Every 1 level up, you gain 2 points. Quest Name are the names of the quests you have accepted. This sign means that you have finished the quest. This sign means that you have not finished the quest. Notepad is used as a reminder in case you forgotten what you need to do. Combat Display Speed is used to how fast you want the combat speed to be. Min Group Join Level is used to set the minimum level of a person can join your group. Anyone under the level you specified will not be able to join. Backpack Ordering is used to to sort your item level from highest level to lowest or from lowest level to highest. Keyboard Shortcut (a.k.a hotkeys) Enabled is used to turn ON and OFF the hotkeys on your keyboard by "ticking" and "unticking" the box. Old Password used to changed your password in case if you believe someone is trying to hack your account. Just type your current password. New Password used to create your new password in case if you believe someone is trying to hack your account. Just type your new desired password. Repeat New Password is used to verify your new password. Save Change is used to save all changes you've done from #1 - #7. 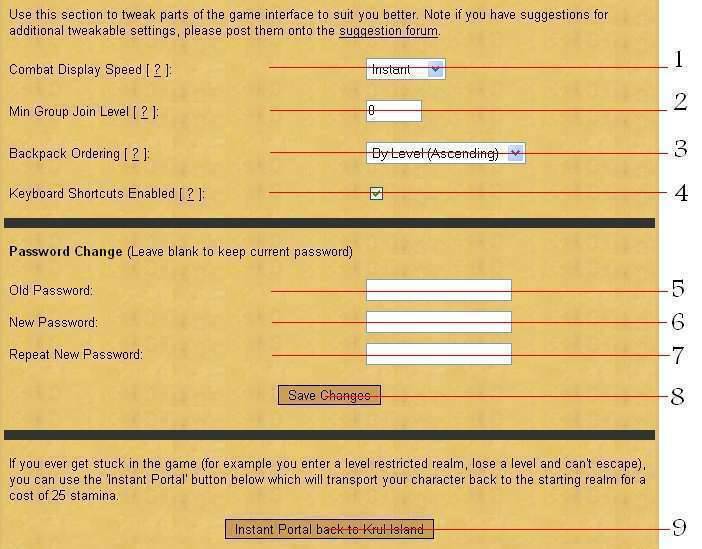 Instant Portal back to Krul Island is used to to return back to the starting point of the game and also can be used if your stuck in a realm with no way out. World Menu allows you to view where you are. View World will immediately take you where you are. Action Menu is where you can find all the stuff you can buy, sell, trade and ect..... while playing this game. Attack Specific Player is used to attack someone that you have in mind or hate. Username is used to add the name of the player you want to attack. Stamina is used to how much power you want to attack that specific player. The higher the stamina the more XP and Golds that player will lose and the amount of Golds you can steal. 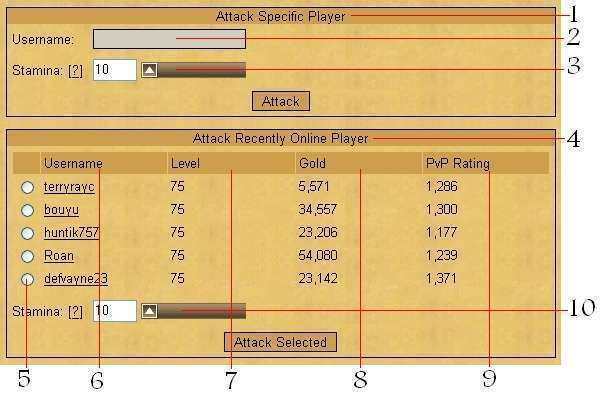 Attack Recently Online Player generates active players of your current level to attack. Click on any of the tick circle to choose whom you want to attack. Username shows the name of recently online players for you to attack. Gold of which that player has in his hand. PvP Rating that the player has. Stamina is used to how much power you want to attack that the player you wish to attack. The higher the stamina the more XP and Golds that player will lose and the amount of Golds you can steal. Blacksmith is the only place that you can repair your equipments you have. It is EXTREMELY important that you repair your equipment. The lower the durability your equipment has the lower the stat will decrease. The longer you let your durability decreases the more expensive it will cost to repair, so try to repair your equipment after every battle. Also Crystalline equipment cannot be repaired but they will not lose stat when their durability decreases. Bank is where you can store your golds in hand into your personal bank. By doing this you can keep your money safe from people whom going to try to steal your golds in hand. You can only deposit 25% of your current golds, example 25% of 943 golds is 236. You start with 1 deposit, if you want more goto upgrade section and buy +1 Deposit for 50 FSP. Offer New Bounty can be used to place a bounty on someone who has attacked you within 48 hours. If 48 hours has passed without even placing bounty on him his name will be deleted from your list. Bounty Champion Pot is the prize for everyone to compete. Every 100 bounty that is made, the prize increases by 1 FSP. After every bounty you complete there is a very small chance that you might win the Bounty Champion Pot. Bounty Ticket shows how much ticket you have. Bounty Ticket are essential to Bounty Board if you want to attempt a bounty or place a bounty on someone. To get more Bounty Ticket goto the Upgrade and you can buy x100 tickets for 1 FSP (Its very cheap for so many so don't even complain that is not enough). Search Username is used to see if the specific player you have in mind is bountied or not. 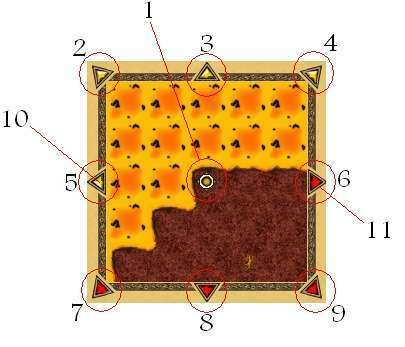 Target is the name and the level of the bountied player. Offerer is the name of the person who placed the bounty. Reward is the amount of Golds or FSP that the offerer place if you completed the bounty. Posted is the date and time of when this bounty was placed. Progress shows how many kills you successfully made. Required Kills is the amount of kills you need to complete the bounty. Ticket Required shows the amount of ticket required to attempt the bounty. Accept is used to take on the bounty that you want. You can use this when ever there is many bounties being placed. Item that you want to craft. 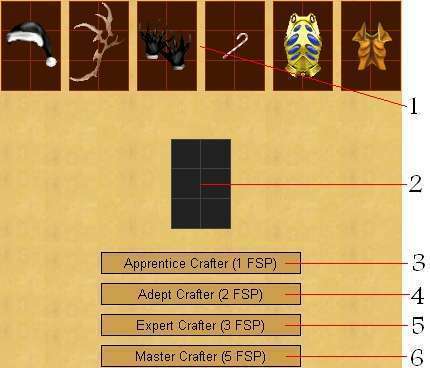 Note that every craft has different stat, so if you craft 2 items and get same craft level you may see that both stat are not the same. Items that you are equipping and in backpack. 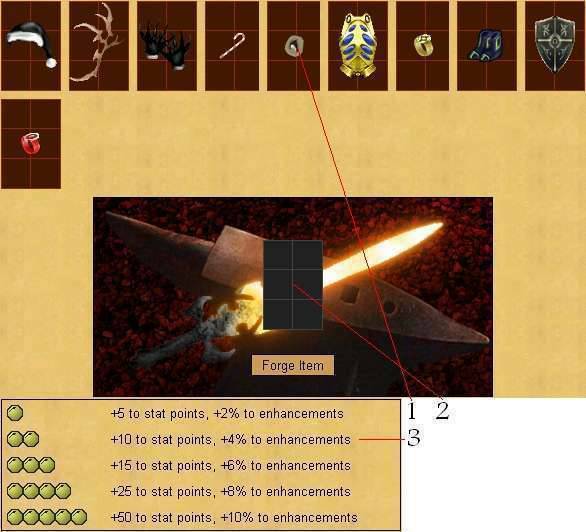 Shows you how much bonuses you get for each forged item get. Sahria (Goddes of Fortune) = Chance to win 2,000,000 golds. Osverin (God of Wisdom) = Chance to win 20 FSP (What more could you ask for Very Happy ) . Gurgriss (God of War) = Chance to draw a decent (Not those garbage ones) item. Lindarsil (Goddes of Magic) = Chance to win a Unique/Legendary/Super-Elite items. Auction House is where you can buy gears and potion for your self to help you out on your quest. To get Items for your current level, goto preference then select the minimum and maximum level item you want to look for. Then press save and click back to see the items. Send to Players is used to send Golds, FSP and/or Items to someone else. Secure Trade is used to buy and sell Items for FSP and/or Golds. Send Message is where you chat privately with someone else. Find Player option is used to search for a player you have in mind. FSP Draw is where you can have a chance to win 1 FSP. There are a total of 25 Draws to be won and each ticket cost 50 golds (1250 golds for all draws per 1 ticket). Id is just ID number of that particular tournament. 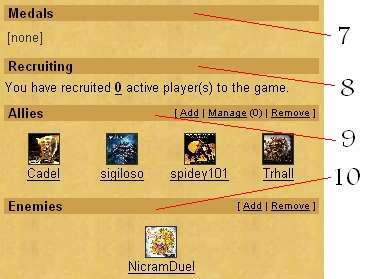 Players shows how many current players are in and what is the maximum players that can join. Join Cost shows how much golds you need to pay to join the tournament. Setup Combat Moves is where you can setup your PvP skills in to help you increase your chance of wining a tournament. a) Open : Where you are free to join the tournament. b) In Progress : Where the tournament has already begun and you cannot participate in it. a) Player's Level is irrelevant to PvP Arena, so all players can play. b) Player's Level Up point will not work in PvP Arena. c) Player's Buff/Skill and Potion will not work in PvP Arena. d) Guild's Stats Bonuses will not work in PvP Arena. e) Guild's Relic Control will not work in PvP Arena. View Completed Tournaments is where you can view who is the winner of that particular tournament. Rewards are the PvP Tournament prize if you win. View is where you can view all players current match against each other. Join is where you can participate in the tournament. This menu allow you to join or create a guild. Create Guild allows you to make your own guild. You'll need to be atleast level 50 and have lots of FSP to invest in your guild. Join Guild allows you to apply membership to a certain guild. A-Z List will show you every single guild that has been made in this game. After joining a Guild, you'll get new option which allow you to view guilds pages and stuff. Guild Logo is where the Guild Avatar is placed. 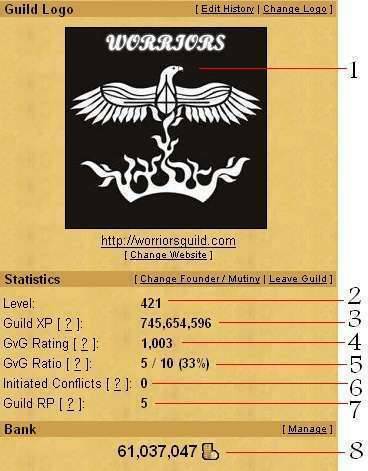 Level is the guilds current level. 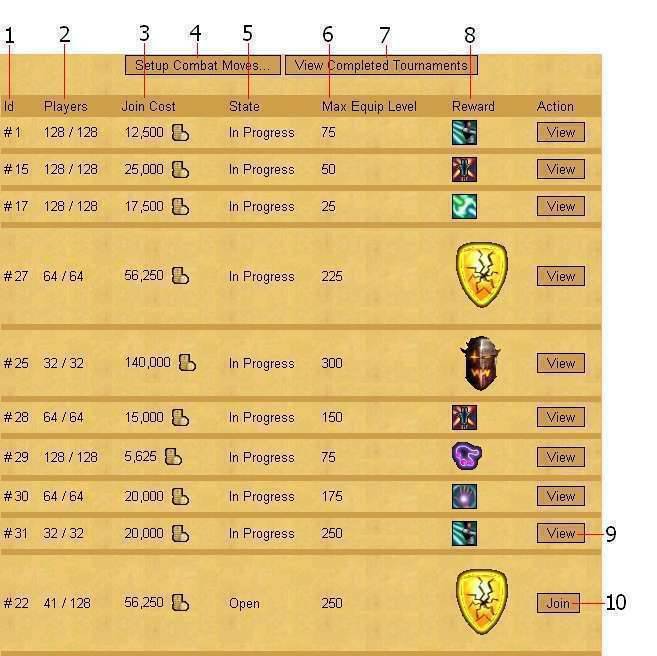 Level can be increased as a guild member contribute more XP to the guild. Guild XP is the current Guild XP that the guild members contributed. After every midnight 1% of the current XP we all have will be locked so that even if a player leaves the guild all of the sudden, the 1% of his XP will permanently be locked in the guild. GvG Rating is rating of the guilds (kinda like PvP except this one is for guild). GvG Ratio show the guilds performance in GvG conflict. Initiated Conflict shows if your guild is waging war on another guild. Guild RP (Reputation) show how much famous your guild is (Not that anyone cares Razz ) and also it allow you to use Guild RP point to buy special Stuff as a reward for your guilds achievement. Members shows how many people are in guild and the maximum the guild can allow players in. Username shows the name of the guild member. Level shows the level of that player. Rank shows the rank of that player and how loyal he is to the guild. The higher your rank the more option that is given to you. Contributed XP is the amount of XP you contributed to the guild by killing creatures. Grey circles means that the player is offline. Green circle means that the player is online. 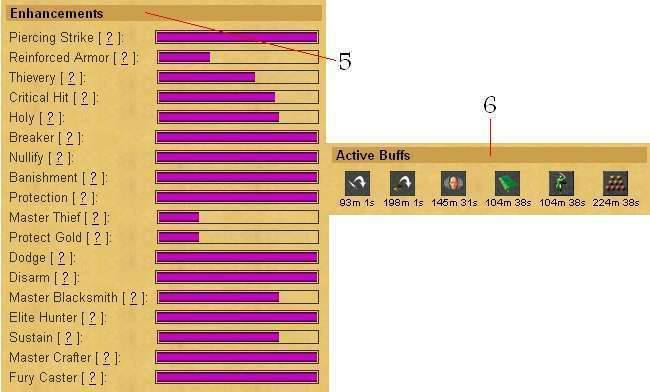 Structure shows how many structure the guild has and how much it can make. Type shows the different features of every structures has. Example Battle Totem increases your Attack by +2 every level or Endurance Shrine increases your Stamina Gain by +5 every level. Level shows the level of the structure. Upkeep is the cost of the structure to gain its bonuses. The higher the level, the more expensive it will cost every 1 hour. 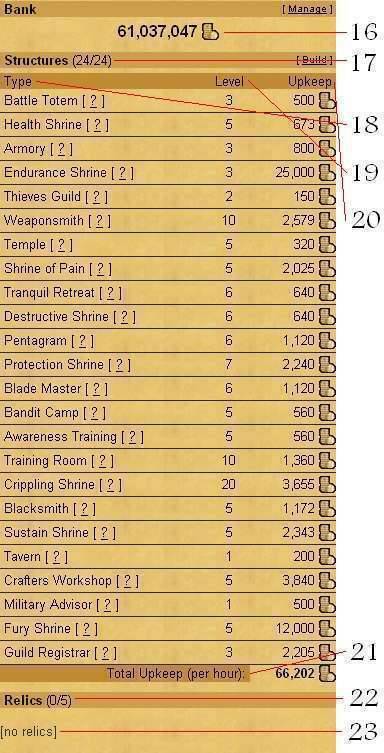 Relic shows how many relics the guild has and how much it can hold. When your guild captures a relic, a relic will appear here and will show the bonuses it has. Invite is used only by Guild Founders and Guild Leaders to invite certain people into the guild. 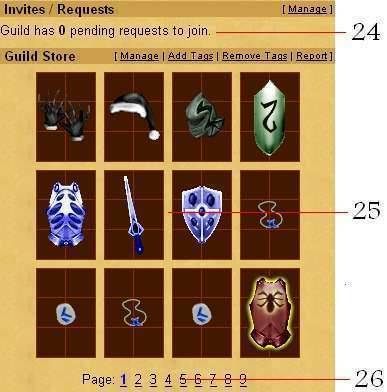 Request shows if there are other players outside of the guild wants to apply into the guild. 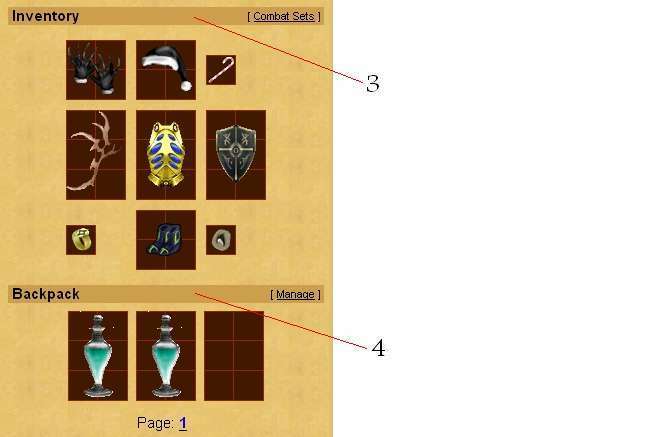 Shows pages of items the guild has. Advisor is where the Guild Founder and Leaders view all guild members static reports and contribution to the guild which makes is easier for the Guild Founders and Leaders warn or kick players from guild. Groups is where you create a group attack to either attack a champion/elite/super elite/legendary creature or capture relics from other guilds. Chat is where you talk to online people. Same as A-Z List before joining guild.Also type in name of guild in the box and it will show u the guild u desire if it exists. Relic Control will show you which guild has which relic and how long they been controlling it. Hire Mercenary shows if their is a mercenary available for hire. If you upgrade Tavern it will show you when will the next mercenary be available. Active Mercenary are shown when you hire them. When highlighting a mercenary a pop up will show the mercenary stats and rank and what enhancement it has as well as a description of that mercenary. Time Remaining is how long the mercenary is staying in guild. Disband is when you no longer need the mercenary or if you do not want it. Top Players is where the top 100 players of the same month and year you and the other players are ranked. This way you can have a chance of being a top 100 player. Top 250 Players is where the Highest level player is ranked. Staying at Top for certain amount of days will award you with a medal for your achievement. Richest Player is where the Richest player in Fallen Sword is ranked. Staying at Top for certain amount of days will award you with a medal for your achievement. PvP Ladder is where the highest PvP points players are ranked. Staying at Top for certain amount of days will award you with a medal for your achievement. Bounty Hunter is where the best bounty hunter is ranked. For each bounty you complete you get points. If it was a 10 hit bounty and you completed it you gain 10 points. If it was a 3 hit bounty and you completed the bounty you get 3 points, etc. In order too gain a medal for being a bounty hunter you have to complete a certain amount of bounties not how long you are on the Top 250 Bounty Hunters. Rising Star shows who has leveled up the most within 24 hours. Not really interesting but fun when comparing with your guild mate within your level. Arena Champions shows who has the most wins in PvP Arena. Top 250 Guild is where the best guild are ranked. It is also best way to find good guilds to join in. Richest Guild show the top 250 richest guild in the game. Well what more do you want me to explain Wink . Guild PvP Ladder (a.k.a Guild vs Guild / GvG) shows the top 250 guild with highest GvG Points. Upgrades is where you can Use, Buy and get Free FSP. +25 Current Stamina = Gives you additional 25 stamina more to make more actions. +10 Maximum Stamina = Increases your maximum stamina by 10 points. The more you buy the longer you can hunt creatures and do more action. +1% Experience towards next level = Increases 1% of your current XP. Details explained at <2.1> #2 . +50,000 Gold = Gain 50,000 golds instantly. It is highly advice you avoid this as you can sell your FSP much higher at Market. +25 XP Gain (per hour) = Simple equation for this is [Your XP Gain * Your Level - 50 / 25] to get the real amount of XP per hour you get. Really good upgrade at level +100 . +1 Stamina Gain (per hour) = Increases your Stamina Gain per hour. Details explained at <2.1> #2 . +1 Bank Deposits per Day = Increases the amount of deposits by 1 daily. +1 Inventory (Backpack) Slot = Increases the amount of space in your backpack to store items. +1 Max Allies = Increases the amount of allies you can add by 1. +1 Max Enemies = Increases the amount of enemies you can add by 1. +1 Max Auctions = Increases the amount of auctions you can add by 1. Also good for selling lots of items at once. Protect XP = Protect XP save your XP lose when your killed by a creature. The more you buy the less XP you lose. This upgrade does not work if you are bountied via Bounty Board. +1 Max Secure Trades = Increases your Secure Trade by 1. This is not needed upgrade as we do not use it everyday. Refill All Bank Deposits = When your out of bank deposit, use this upgrade to refill your bank deposit. Bounty Tickets (100x) = If you like taking bounties or chosen to become a bounty hunter, then it is advisable to have atleast minimum 200-400 tickets as you'll be doing lots of bounties. Reset 'Level Up' Points = This upgrade will reset your Level Up Points and be able to redistribute your points. +1 Marketplace Listing = Increases your market listing by 1. If you have more then 400 FSP and ant to sell them in different prices, then use this upgrade. +1 Combat Sets = Increases your combat sets by 1. If you have lots of items in your backpack and have no room for extra set slots, then use this upgrade. +25 Bio Characters = Increases your bio character by 25 letters. If you run out of text limit in your bio, then use this upgrade. Buying Points is where you can buy FSP with real money. Donating money helps the developers keep this game free and alive for all to play. Note that not all players can do these Free Points offer as we all are from different countries. If you don't see any offer from your country then do not complaint as your not the only one who's not having this advantage. Also do not ask someone from another country to do that offer for you as HCS stated that no one can help anyone do the free offers, or the 2 party might face account suspension or termination. What ? You seriously expecting me to explain what a forum is ? Get serious -.- !! This page was last modified on 29 March 2011, at 01:24. This page has been accessed 47,032 times.